The Secret to become an extreme success? Extreme success results from an extreme personality and comes at the cost of many other things. Extreme success is different from what I suppose you could just consider ’success‘, so know that you don’t have to be Richard or Elon to be affluent and accomplished and maintain a great lifestyle. Your odds of happiness are better that way. But if you’re extreme, you must be what you are, which means that happiness is more or less beside the point. These people tend to be freaks and misfits who were forced to experience the world in an unusually challenging way. They developed strategies to survive, and as they grow older they find ways to apply these strategies to other things, and create for themselves a distinct and powerful advantage. They don’t think the way other people think. They see things from angles that unlock new ideas and insights. Other people consider them to be somewhat insane. If you’re not obsessed, then stop what you’re doing and find whatever does obsess you. It helps to have an ego, but you must be in service to something bigger if you are to inspire the people you need to help you (and make no mistake, you will need them). That ’something bigger‘ prevents you from going off into the ether when people flock round you and tell you how fabulous you are when you aren’t and how great your stuff is when it isn’t. Don’t pursue something because you „want to be great“. Pursue something because it fascinates you, because the pursuit itself engages and compels you. Extreme people combine brilliance and talent with an insane work ethic, so if the work itself doesn’t drive you, you will burn out or fall by the wayside or your extreme competitors will crush you and make you cry. Don’t follow a pre-existing path, and don’t look to imitate your role models. There is no „next step“. Extreme success is not like other kinds of success; what has worked for someone else, probably won’t work for you. They are individuals with bold points of view who exploit their very particular set of unique and particular strengths. They are unconventional, and one reason they become the entrepreneurs they become is because they can’t or don’t or won’t fit into the structures and routines of corporate life. They are dyslexic, they are autistic, they have ADD, they are square pegs in round holes, they piss people off, get into arguments, rock the boat, laugh in the face of paperwork. But they transform weaknesses in ways that create added advantage — the strategies I mentioned earlier — and seek partnerships with people who excel in the areas where they have no talent whatsoever. They do not fear failure — or they do, but they move ahead anyway. They will experience heroic, spectacular, humiliating, very public failure but find a way to reframe until it isn’t failure at all. When they fail in ways that other people won’t, they learn things that other people don’t and never will. They have incredible grit and resilience.They are unlikely to be reading stuff like this. (This is *not* to slam or criticize people who do; I love to read this stuff myself.) They are more likely to go straight to a book: perhaps a biography of Alexander the Great or Catherine the Great or someone else they consider Great. Surfing the ‚Net is a deadly timesuck, and given what they know their time is worth — even back in the day when technically it was not worth that — they can’t afford it. I could go on, it’s a fascinating subject, but you get the idea. I wish you luck and strength and perhaps a stiff drink should you need it. 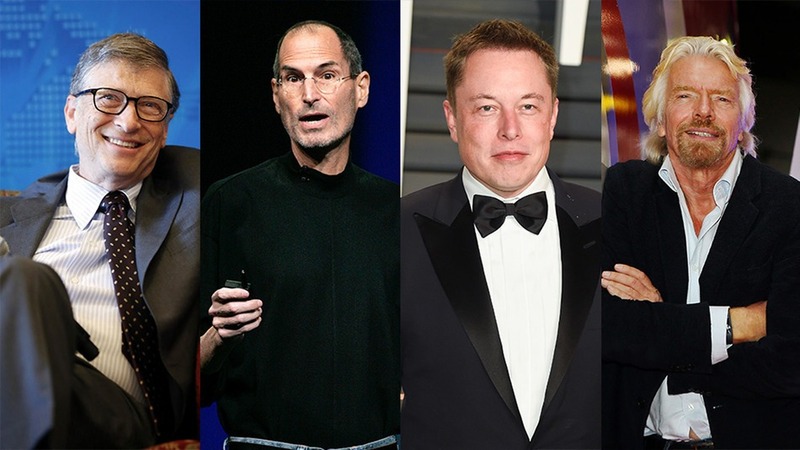 Dieser Eintrag wurde veröffentlicht in Innovation, Innovatoren und getaggt mit Bill Gates, Elon Musk, Richard Branson, Steve Jobs am 23. April 2015 von innovation. Innovation is one of the most powerful forces in the world. Innovation is one of the most powerful forces in the world. It can make the impossible possible. Dieser Eintrag wurde veröffentlicht in Innovatoren und getaggt mit Bill Gates, Energy, Energy Innovations Summit, Innovation, renewable Energy am 20. Oktober 2011 von innovation.